I stumbled upon something strange today while writing up a story about how the Fortnite cube crushed a building in Tilted Towers. Looking up an image of Tilted Towers on Google brought up a listing for a real world address. But it wasn’t just any address; it was the site of One World Trade Center, also known as the Freedom Tower. The Freedom Tower is the tallest skyscraper in the Western Hemisphere, erected in the aftermath of the September 11, 2001 terrorist attacks in downtown Manhattan. 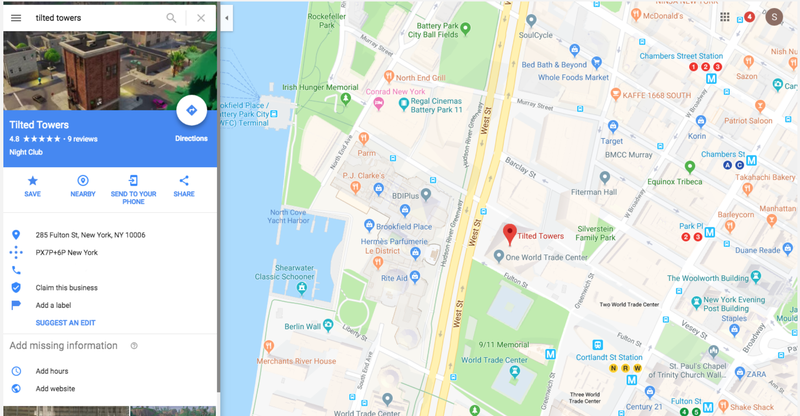 When I searched Google for “Tilted Towers” this morning, the building’s address (alongside a 4.3 star review) said that it was a nightclub located at the site of the Freedom Tower. There were also multiple reviews of Tilted Towers, the actual video game location..
Google search results no longer feature an address for Tilted Towers. I followed up to ask Google to clarify the factors that could have led to the listing, including how many users are required to make a suggestion before they appear, but did not receive a reply in time for publication.